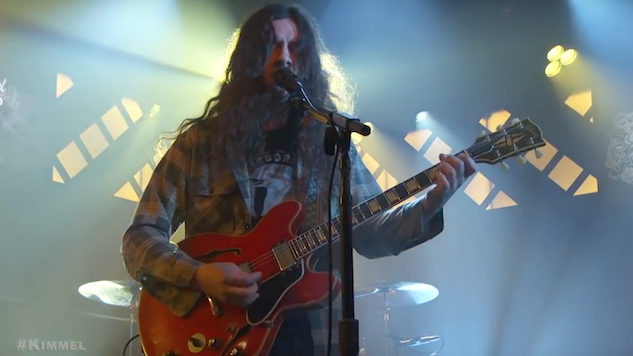 Watch Kurt Vile Perform "Loading Zones" on Jimmy Kimmel Live! Kurt Vile brought “Loading Zones” to Jimmy Kimmel Live! on Thursday night, performing the track as the late-night show’s musical guest for the evening. “Loading Zones” is taken from Vile’s latest album, Bottle It In. Released in October, Bottle It In is Vile’s eighth studio album, following his collaboration with Courtney Barnett in 2017 on Lotta Sea Lice and his last solo venture, b’lieve I’m goin down … in 2015. The former produced the indie-rocker’s most commercially successful single, “Pretty Pimpin’,” leading to major anticipation for this year’s release. The performance was put on as part of Kimmel’s Mercedes Benz Concert Series. Characteristically no-fuss, a colorful backdrop was all that accompanied the grunge-styled band members. Unsurprisingly, Vile’s live performance delivers, highlighting the track’s relentless rhythm and the almost psychedelic, experimental solo (during which an eagle-eyed viewer would notice the constant re-tuning of Vile’s Gibson) that closes it all out. Check out the performance below and revisit Vile’s chat with Paste assistant music editor Lizzie Manno earlier this year here. Find Paste’s thoughts on the album here and Vile’s upcoming performance dates further down below.